Oh, how time has flown the last few months. I’ve been behind on logging my cooking projects, largely due to the fact that the sight of food wasn’t very pleasing for the first half of my pregnancy. Now that I’m over that hurdle, I’m raring to eat. Fried foods are great for a recovering stomach, but I felt I could use something healthier than the usual deep frying method. I first fell in love with hushpuppies when I was eight years old and living in Fort Polk, Louisiana. My dad would order a six-inch high plate of crawfish when we went out to eat. Being a vegetarian in the making, I refused to eat any fish or seafood. I would instead order a tower of hushpuppies and ketchup. I remember always leaving two hushpuppies on the plate, resolving myself to eating every one of them the next time. No hushpuppy should be left behind. INGREDIENTS: 1) 2/3 cup yellow cornmeal 2) 1/2 cup all-purpose flour 3) 1 teaspoon baking powder 4) 1/2 teaspoon salt 5)1/2 cup finely chopped onion 6) 1/3 cup milk 7) 1 tablespoon vegetable oil 8) 2 egg whites, beaten 9) vegetable cooking spray 10) 2 stalks chopped parsley INSTRUCTIONS: Combine cornmeal, flour, baking powder, and salt in a medium bowl; make a well in center. In a separate container, combine onions, milk, vegetable oil, and beaten egg whites. Add to dry ingredients, stirring just until moistened. Spoon 1 tablespoon batter per hush puppy onto a cooking sheet coated with cooking spray. Bake at 450 degrees for 10 minutes or until lightly browned. Remove from pan immediately. Recipe slightly modified from cooks.com. INSTRUCTIONS: Heat a pan on medium heat with a generous amount of vegetable oil. 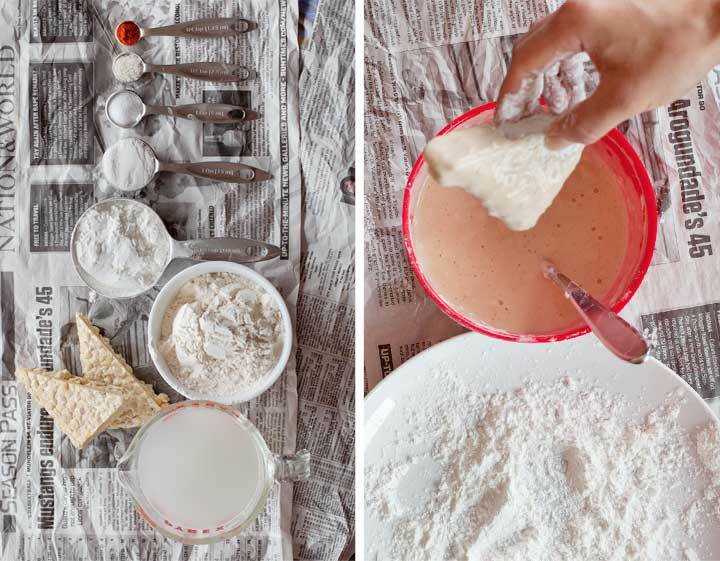 Place the corn starch on a plate and set aside. Combine the flour, baking powder, salt, garlic powder, and cayenne pepper in a bowl. Slowly add the water/yeast mixture to the dry ingredients, mixing until batter is smooth. Coat tempeh pieces in the corn starch and then dip the in the batter. Place the coated tempeh in the heated pan and fry until golden brown on each side. Everyone in the household, vegetarian and carnivore, tried this and thought it was pretty tasty, especially considering the hushpuppies were baked and the “fish” was really tempeh. Next time I may brown the tempeh before coating it in batter to give it a little more complexity, but other than that, this hit the spot. 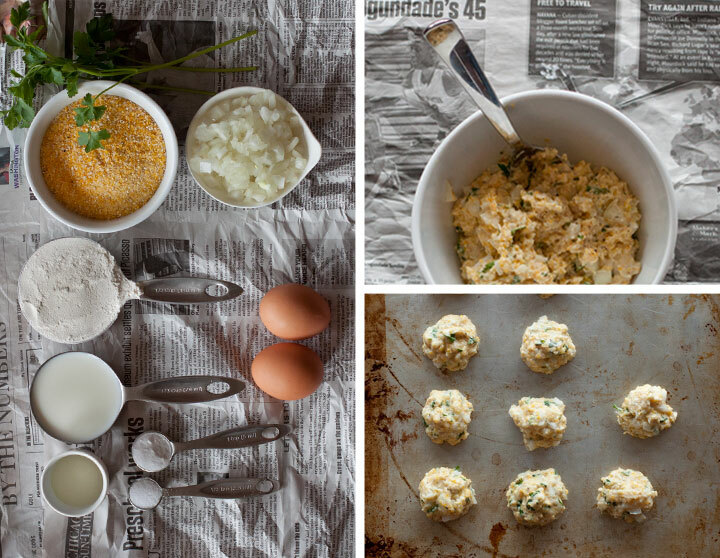 Here’s hoping you can create a healthier version of an old favorite recipe of your own. 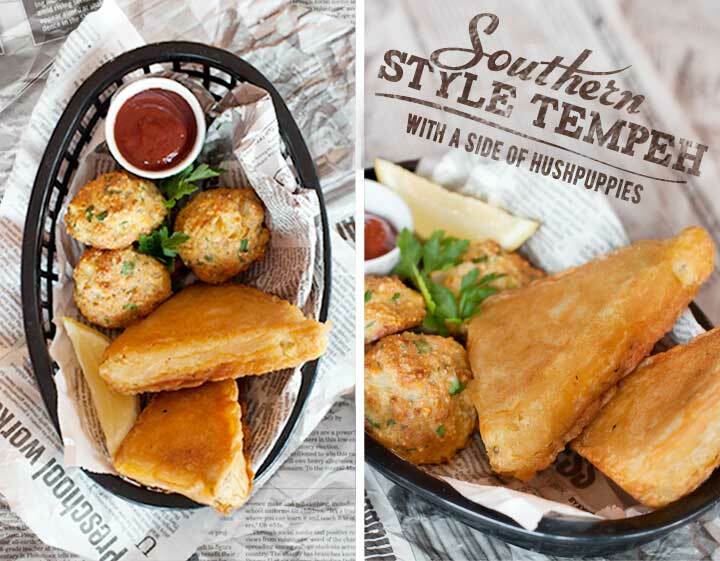 § 2 Responses to Southern Style Tempeh with a Side of Hushpuppies"
A very healthy recipe for hush puppies. Thanks! They were pretty tasty.